Longevity: You want a fence company that has been around, a fence company that is well-established in the marketplace. Knowledge: You want a company that knows what they are talking about. You want a company that can answer your questions. Quality: You would think quality and fencing would go hand-in-hand, but not every company feels as strongly about their products as you would hope. You want a company that stands behind their product. This means providing industry-leading warranties. Affordability: You want the highest quality fence at the best possible price. In today’s economy, you cannot afford to spend exorbitant amounts on a new residential fence. If you want a residential fence company that checks off each of the above requirements, you want Hercules Fence, the largest fence company in Northern Virginia! Longevity? Check! With over 50 years in the fence business, Hercules Fence knows a thing or two about fencing. 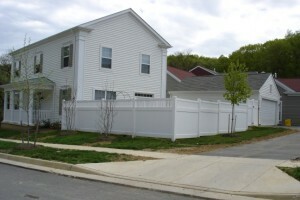 We have been installing a wide range of residential fence options throughout Northern Virginia since 1955. Knowledge? Check! The knowledgeable people of Hercules Fence have developed a reputation for professional service and quality installation. We are here to answer any questions you may have and help you choose the best fence for your wants, needs, and, perhaps most importantly, your budget. We look forward to hearing from you and meeting your fencing needs. Quality? Check! While many companies can install a product that may appear to be well constructed immediately following installation, Hercules Fence can provide a fence that you will be proud of for many years. For this reason we offer extended warranties on all of our products. Affordability? Check! In addition to offering you experience, superior customer service, and quality, Hercules Fence can offer the buying power of the largest residential fence company based in Northern Virginia. And that is just the tip of the iceberg! Our experienced sales and installation staff can handle any of your fencing needs. This entry was posted on Thursday, May 15th, 2014 at 3:00 pm. Both comments and pings are currently closed.